Vehicle determination assistance to find the vehicle which best suits your needs for personal or commercial use. We specialize in 1945-present cars and light-duty trucks. Please continue below for information on our most popular services. Are you looking at a car for sale in the southeast Michigan or northwest Ohio area but it is not practical for you to travel to see it in person? Let Gilbert Vehicle Services inspect it for you! We have over 30 years experience in the classic car hobby. We offer various levels of vehicle inspection based on your needs. Visual inspection ($250): we inspect the vehicle condition using our proprietary inspection checklist and quantitative measurements when available (paint thickness & panel gaps). We inspect the vehicle’s general condition, looking for any previous damage, poor workmanship, leaking fluids, etc. We record the VIN, Trim Tag, body number, and any other ID number with is visible with any disassembly and decode these to the best of our ability to authenticate the vehicle's "as-built" configuration. Minimum 40 high-resolution pictures are provided. A final written report summarizes our findings. Engine Numbers Authenticity Check ($25): During the visual inspection, we record the engine number and any other mechanical component ID number which is visible without disassembling any part of the vehicle. We then decode these numbers to the best of our ability using our library of automotive reference materials. Paint Color Authenticity Check ($25): During the visual inspection, we compare the current paint color of the vehicle with our large inventory of vintage O.E. paint samples (American cars & trucks from 1949-1982). Borescope Inspection ($50): We use a borescope to inspect accessible structural areas of the vehicle, looking for corrosion or damage. A travel fee of $0.60/mile from zip code 48068 (Detroit) is added to the prices above. Visual Inspection & Appraisal ($125): We visually inspect your vehicle, audibly inspect mechanicals and visually check underbody. Based off the vehicle’s condition and appearance we research recent collector vehicle market transactions to determine an appropriate value for your vehicle. VIN & Trim Tag Decoding ($25): We decode VIN, trim tag, body number, and any other ID numbers to the best of our ability to authenticate the vehicle's "as built" configuration and its options using our library of automotive reference materials. Engine Numbers Authenticity Check ($25): We decode engine number and any other mechanical component ID numbers to the best of our ability using our library of automotive reference materials. Paint Color Authenticity Check ($25): We compare the current paint color of the vehicle with our large inventory of vintage O.E. paint samples (American cars & trucks from 1949-1982). Please note, Gilbert Vehicle Services is not a licensed classic vehicle appraiser. Our valuation is based off current price guides, similar vehicles for sale and recent auction results. If you require a licensed appraiser with classic car certification who can offer diminished value, total loss, legal arbitration support and other specialized valuation services, please contact us. We will refer you to a licensed, full-time appraiser with classic car certification in the Metro Detroit Area. Vehicle Advertising & Marketing Support. We inspect the vehicle, take pictures, authenticate any rare options, advise on any issue remediation to make the vehicle more marketable, estimate the value of the vehicle, write an advertisement, upload pictures them to an online photo album and strategically place ads online for the vehicle to gain the most exposure for the owner. The owner schedules showings and negotiates the final sale. Our rates for advertising and marketing support are $150 for vehicles priced $5000 or less and 2.5% of final sale price on vehicles over $5000. Full brokerage. Full brokerage includes all the items listed under Vehicle Advertising & Marketing Support, and also includes Gilbert Vehicle Services taking possession of the vehicle and completing the sale on behalf of the owner. The rate for this service is $300 for vehicles priced under $5000 and 6% of sales price on vehicles over $5000. Do you want the "numbers" decoded on your classic American car to verify its original equipment & options? We can help! We have a vast library of automotive reference books for decoding the VIN, Trim Tag, engine numbers and other key features on most 1945-present American cars & trucks. We will decode these numbers for you & provide our interpretation of them in a short written report for only $50. 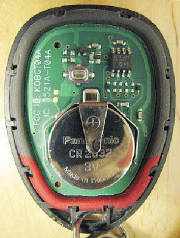 GM Keyless Entry Remote (aka Key Fob) often fail due to poor solder joints on the printed circuit board. Our process to rejuvenate these keyless entry remotes is to disassemble, clean and re-flow solder joints of the circuit board. We also install a new battery. Our fee for this service is $35 and our turnaround time is 3 days. We can also install new buttons for additional cost. Contact us via email or at 248-259-4999 to learn more details about our services.